Did you know that Pulau Tekong Besar used to have a thriving community before it was converted into an exclusive training base for the Army? The island, situated off the north eastern coast of Singapore, is joined to Pulau Tekong Kechil today after land reclamation efforts in the 1990s. It is hard to imagine that the island used to have a population of about 4,000 people in the 1950s. 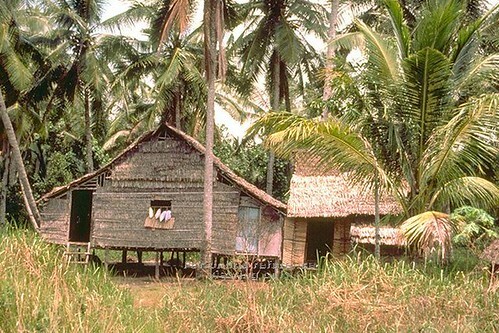 Commodities such as rubber, coconut, vegetables, prawns, fish, and tropical fruits were the main produce of the people living on the island. Several kampongs littered this little island before the Government's intervention and these pastoral villages were similar to those on other offshore islands such as Pulau Sakijang Bendera. 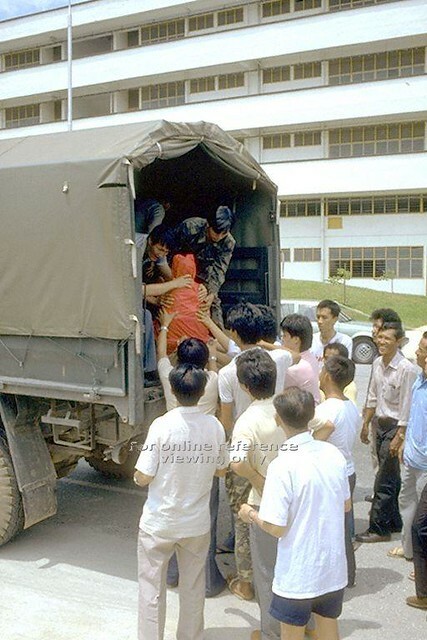 (The more prominent kampongs on Pulau Tekong Besar include Kampong Selabin, Kampong Batu Koyok, Kampong Sanyongkong, Kampong Unum and Kampong Permatang, all important checkpoints being used by Army trainees in their navigation exercises today). 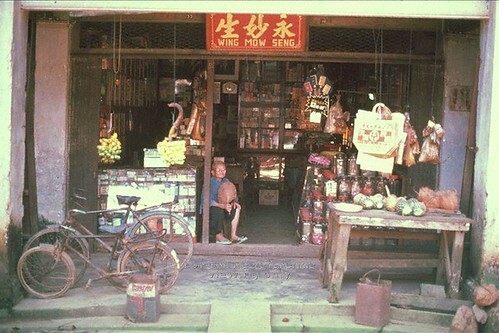 Slowly, as the numbers on the island grew, a small township was established on the island with a row of wooden shophouses providing commodities for the islanders, thus eliminating the need to travel by boat to the mainland to purchase perishable goods such as bread or rice. With such a large and flourishing population, places of worship were naturally constructed and there were at least 3 temples and a mosque on the island. These religious sanctuaries ensured that the Tekong natives could seek inner peace and practice their devotion without having to row their sampans to Changi, the nearest village on the mainland. 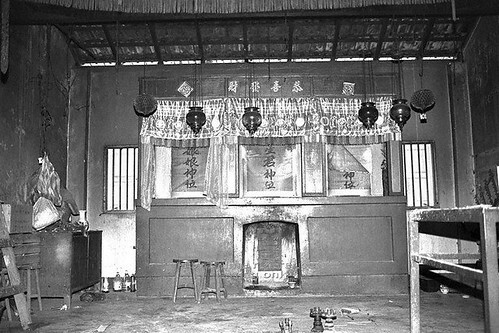 One such temple was the Pulau Tekong Tai Yang Gong Temple (roughly translated as the Pulau Tekong Sun Deity Temple). This temple is devoted to the worship of Tai Yang Gong - Lord Tai Yang, also known as the Chinese Sun Deity or Lord of the Sun. Lord Tai Yang is an important deity which provides direct blessings from the heavenly realm. Thus, many Taoist devotees pray to Lord Tai Yang in the hope that their wishes would come true. Those who offered their prayers at the temple often asserted that their prayers were answered in the form of health or wealth. This led to many "mainlanders" making a short pilgrimage to the temple to pray too. 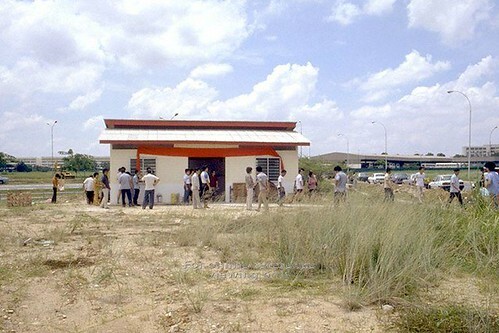 However, with the island inevitably being taken over by the Government for military purposes, the temple had it coming when it was announced that it had to be relocated to Bedok North Avenue 4, a sandy and open land parcel at that time. This temple paved the way for many others to follow suit, as there are a total of 4 temples in the vicinity today. And so, on that fateful day in 1986, a convoy of Mercedes Benz 3-Tonne military trucks (fondly known as 3-Tonners) traveled to the entrance of the quaint temple and the temple belongings were loaded onto the trucks. 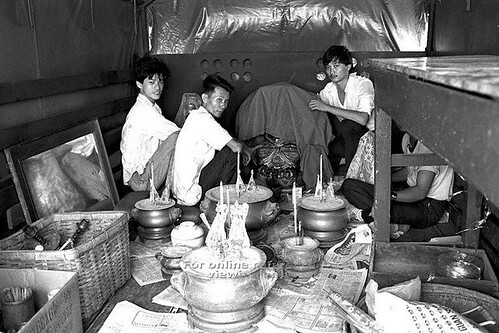 In the heat of the mid morning sun, large boxes carved with intricate Taoist motifs and filled to the brim with a myriad of religious knick-knacks were hoisted one by one onto the trucks by a mixture of devotees, temple hands and soldiers clad in their Number-4 uniforms. It was a boisterous affair, a spectacle which would soon be a thing of the past for the island itself. 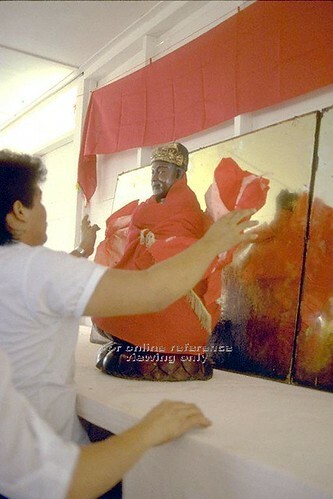 The idol of Lord Tai Yang himself was covered in red cloth (a Taoist practice to prevent malevolent spirits from entering the idol during its transfer) and loaded onto a 3-Tonner, accompanied by 3 temple hands. 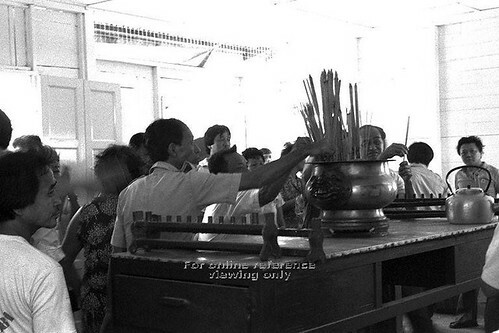 Several urns used for offering joss sticks were also placed on the same truck. During the entire journey, a 2-man band would play a monotonous tune which requires a drum and a gong, an announcement of sorts to sound out that a shifting ceremony was taking place. 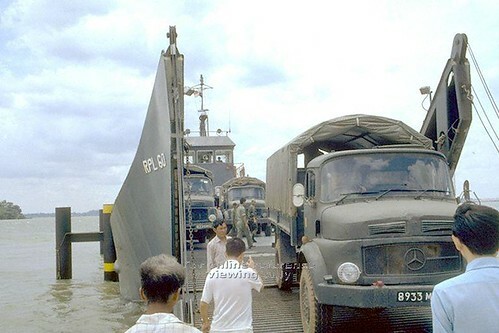 The entire journey was a tedious process, as the convoy had to take a Navy operated RPL (Ramp Power Launch, a flat-decked craft with ramps at both ends and used to transport vehicles across water bodies) from the slipway in Pulau Tekong to the Commando Jetty at Changi, after-which the entourage had to endure another bumpy ride in the sweltering confines of the military truck to the new location in Bedok North Avenue 4. Made for the rigours of battle, sitting on the hard wooden benches in the back of the truck, which also happened to have rock-hard suspension, certainly wasn't the most comfortable of rides. At the new location, a handful of devotees were already on hand to welcome the idol to the mainland. As the military convoy cruised towards its destination, another convoy made up of civilian cars had formed up in tow, making for an extremely long line of cars. One could imagine how important this deity was to the devotees. It was almost like the arrival of a VIP, chaperoned by the presence of many. One by one, the large boxes came down the trucks and into the new temple building. 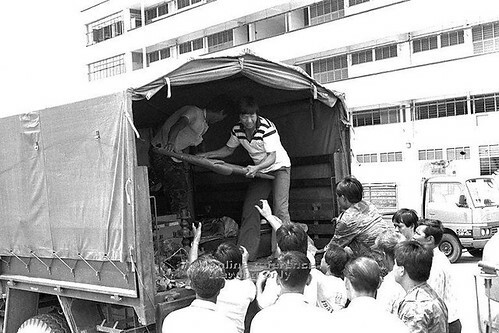 Everyone, from devotee to soldier, played their part to unload the items as fast as they could. When they were finally done, it was time for the idol to make its way into its new sanctuary. Temple hands carefully lifted the idol across the sandy path into the temple building, and devout worshipers had started offering joss sticks to Lord Tai Yang while the idol made its grand entrance. It was placed on the new altar, where it sat prettily for the first time and the red cloth was removed. Blogger Cavin Teo has a post on his visit to the new temple here. Although it is nothing glamorous compared to larger temples such as the elaborate Buddha Tooth Relic Temple and Museum in Chinatown, the modest Lord Tai Yang temple was given a modern day makeover and is a far cry today from the simple wooden hut it started off with in 1986. Today, it is listed as the Tian Kong Temple, housing not just Lord Tai Yang but also incorporating a handful of other Taoist deities under its roof. In this temple, there is also a curious deity which has caught the eye of many visitors. The idol, clad in traditional Malay clothes and made in the mold of a Malay man, was actually a part of the shrine on Pulau Sajahat (an island next to Pulau Tekong). Known as Tuan Pek Gong, this peculiar deity has drawn curious stares from many devotees who are unsure of who this deity is. "According to legend, in the early 19th century, there used to be an old man with a mustache often seen rowing a small boat at Pulau Sajahat. People have seen him a few times, and one day out of curiosity, they decided to follow him to the island. But when they reached the island, he disappeared. There was nothing on the island except for a large rock. In the mid 15 century (to be verified), the Acehnese and the Portugese had a naval war around the waters of Pulau Tekong. The Portugese defeated the Achenese at that time, and the commander in chief of the Acehnese committed suicide together with the remaining warriors. People believe that the old man was that particular commander and when he died, he created waves to upset the sailors around the region. Therefore people started to erect a statue and called him Tuan Pek Kong to pray for peace. 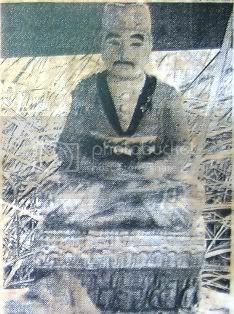 Tuan Pek Kong was later installed at the Pulau Tekong Sun Deity temple and this temple was later relocated to Bedok North Ave 4 where the statue now remains." This was indeed one unique temple which utilised an entire military convoy during its shifting, possibly the first and only temple to do so. Hence, the story of this temple's shifting from Pulau Tekong to the mainland would be something which will be remembered for years to come. Hi Abao, these are actually Mercedez Benz 3-Tonne trucks used between the 1980s to 1990s. They were superseded by the Iveco Fiat 3-Tonne trucks in the 1990s (during my time) and eventually the new 5-Tonne MAN trucks we see on the road today. These old Mercedes 3 Tonners do look like our Unimogs (also known as the 1.5-tonne to some) but they have a cabin with round edges as opposed to the squarish cabin of the unimog. Thanks for commenting! We hope you find our articles engaging and interesting. Just wish to express my appreciation. My maternal grandma was the temple medium of this temple. 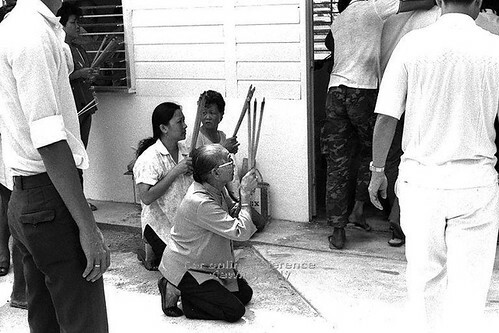 I spent my happiest days of my lives at Pulau Tekong and the temple. Thanks for covering this forgotten history. Well done..! My mum was from P. Tekong Besar before moving to Bedok North. Once in a while my parents would take me to visit my grandparents there. I was very young then, but still remember the best moments there. In yr 2000, I returned to do my BMT there. Frankly I was very happy to return(most of my other army friends hated the island). 1 - Any story about the mosque and all the cemeteries there (Including P. Tekong Kechil)? Dear Anonymous, thank you for your encouraging comments! 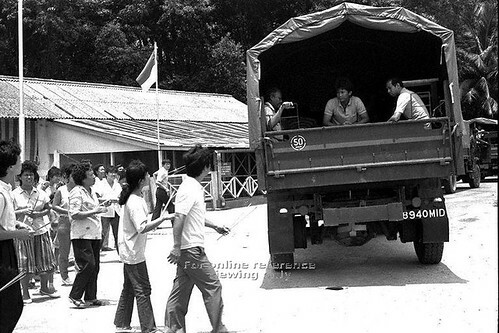 Pulau Tekong holds a special place in all the hearts of those who were conscripted to serve their BMT on the island. It was the first time that I moved out of the concrete jungle and into a real jungle with plants (other than Outward Bound School) when I was posted to BMTC School 1 for my basic military training as well! The training was tough, no doubt about that, but I also got to see nature in all its beauty. 1 - We will most certainly be covering those topics in the future. Thanks for bringing up those ideas! 2 - I believe you are referring to the Dogra Bridge, which was named after the Dogra 17th Regiment, an infantry regiment of the British Indian Army who were stationed on Pulau Tekong when the Japanese attacked Singapore. Thanks Aaron "Six Stomachs" Chan for the info. of the Dogra bridge. I really love to find out more about the mysteries of Tekong Besar, also Tekong Kechil & Pulau Sajahat & Pulau Unum. 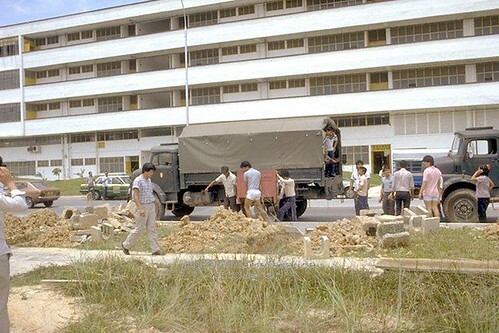 You'll be surprised to know that there were people living at Unum & Tekong Kechil as well. 1- My aunt used to work at the rubber/tobacco plantation there. 2- 'Buniyan' - A type of genie/ghost in Malay (whatever they may call them) is the most often heard ghost stories there (Apart from those army stories). Some 'lucky' people stumbled upon their (The Buniyan) villages in the night, but when they returned during the day, there was nothing there. I was told a few locations, one was at Unum, one at the old camp 3 etc. 3- Pulau Sajahat & Tekong Besar will merged during low tide. 4- Talking about Pulau Sajahat, the 2 mysterious shrines there. 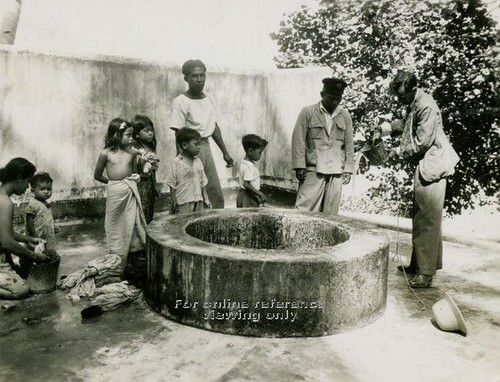 6- The founders of Pulau Tekong Besar were actually from Pahang due to the civil war back in the 1800s. Hi Anonymous, you're most welcome! Thanks for sharing those stories with us. It is certainly very interesting! I've heard about stories of the 'Buniyan' village before as well! Soldiers have reported seeing "lights resembling a village" but never seem to be able to locate it. Unum has the reputation of being the most haunted place on Tekong Besar. It would look dark and gloomy during the day, and compass needles would spin randomly in the vicinity for no apparent reason. There's also a swamp in Unum where many soldiers have reportedly lost their lives after being pulled under. Interesting info about P.Sajahat and P.Tekong Besar. Sadly, P.Sajahat and P.Tekong Kechil have since been reclaimed as part of Teong Besar. I am most keen on visiting P.Sajahat. I heard from a friend that there is a Datuk Gong shrine on the island. I've yet to see that for myself. Hi Aaron! I'm thinking of a way to go there too, maybe can request special permission from Mindef. Anyway I'm sharing you this link rgd Pulau Sajahat : http://www.larkin.net.au/pulau_sejahat/index.html. In some of the pics, you can actually see some wooden stilts. My mum told me they are actually graves. I went to Pusara Abadi (Muslim Cemetery) a few days back to visit my great-grandparents graves, there are lots of graves from P.Tekong Besar. But none from Tekong Kechil & Sajahat. Hi Aaron! A Happy Chinese New Year to you. 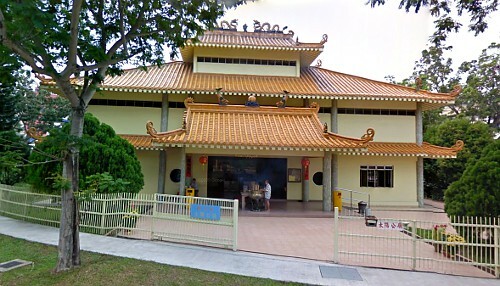 While searching for info online, I read upon the "Loyang Tua Pek Kong" temple. Amazingly, this temple even has a Hindu temple & Muslim keramat inside. The muslim keramat is called 'Datok Keramat'. I've heard that the Datok Gong shrine at P.Sajahat has been moved somewhere (due to reclaimation work with Tekong Besar, Sajahat may logically be a restricted area). Somehow I suspected that the 'Datok Gong' shrine & 'Datok Keramat' MAYBE related. This is a great post! Finally something about Pulau Tekong's history instead of ghost stories! There is still a shrine a Pulau Sejahat along the remnants of a British outpost. The shrine is dedicated to Tua Peh Kong. Much land reclamation has taken place at P.Tekong, but P.Sejahat and P.Tekong Kechil can still be seen. There are two bridges connecting to the reclaimed land, the one nearer to Sanyongkong is Dogra Bridge while the one nearer to Batu Koyok is Sphinx Bridge, named after the Sphinx Battery. It is also possible to get to the reclaimed land on a strip of land connecting the two. Hi Anon (who posted on Jan 16), I think it would be difficult to obtain information from MINDEF as P.Tekong is a rather sensitive area to start with. Having said that, I have seen (nature) hobby groups who have managed to venture onto the island under the watchful eye of MINDEF to carry out their photowalks along the non-urbanised areas. Anyway, we will try to see what we can do. I think the authorities will not be as open to a group of exploration enthusiasts as opposed to a group of nature ramblers though. Pusura Abadi is an interesting place, it contains many graves from the former Bidadari Cemetery too, right? The fact that none of the graves from P.Sajahat and P.Tekong Kechil were transferred there makes me curious - for convenience's sake, the authorities could have simply relocated all the graves from the Tekong group of islands to the same location, but why didn't they? Maybe there are simply too many graves in Pusara Abadi so it is hard to find the few from Sajahat / Tekong Kechil? For the Datuk Gong, I think there are many of them. Some are of Chinese origin, while some are Malay, but they most certainly seem to be Muslim (hence the "no pork and alcohol" rule around their keramats). They were originated from Malaysian Chinese Taoism (that's a long word) so I guess you could trace the worship of Datuk Gong back to Malaysia. 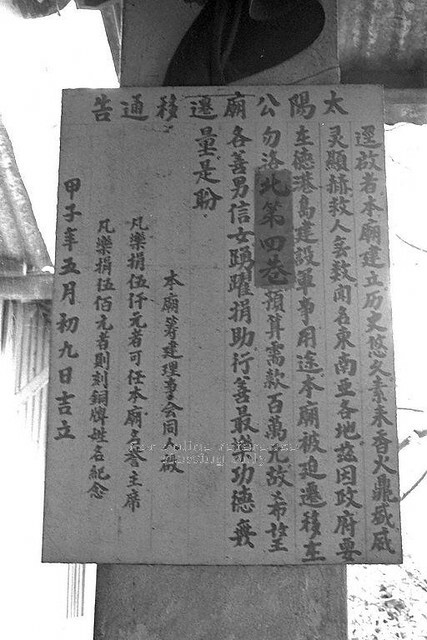 Even the widely revered "Tua Pek Gong" is a local Malaysian Chinese diety himself, and stems out from Datuk Gong worship. Hi Anon (Jan 22), actually Tua Pek Gong is one of the Datuk Gongs himself, supposedly a Hakka whose boat, originally headed for Sumatra, was brought by the sea winds to Penang instead in the 18th century. Hence, I think it is not uncommon to see him being worshipped along with other Datuk Gongs. He was worshipped after his death in Penang and a temple was erected in his honour - the area where the temple was built is now known as Tanjung Tokong (Temple Cape). The Loyang Tua Pek Gong is indeed an interesting place due to the fusion of religion and different cultures. Have you tried your luck looking for divine numbers on the Datuk Keramat rock? Some people claimed to have struck 4D based on revelations from the smoke emitting from the kemayan incense burner. Xinli - thanks for your encouraging comments and for sharing your link! I've always wanted to visit the British outpost and remains of the shrine on P.Sajahat, but I think it would be very difficult to obtain permission to access the island, even more so now that it is linked to Tekong Besar. 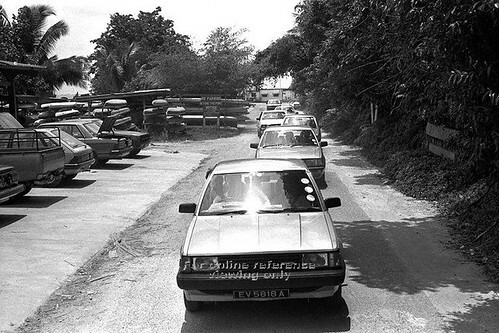 The strip of land connecting the reclaimed land to Tekong Mainland is fondly known as the "Central Culvert" right? I remember crossing a teeny-weeny little concrete bridge across a small (and I mean really small) stream in this area. It is a stark contrast as compared to the wide channels which run below the Sphinx and Dogra bridges. The Past and Present of Tekong Island in Singapore" lots of info rgd Tekong. I just hope that MINDEF is kind enough for any exploration visit. For me, what makes me want to visit Pulau Sejahat is to confirm that there is another shrine there, and also a small cemetery. I've heard rumours of their existence, and even confirmed by a few old mukim maps I found while searching Nat'l Archives. Aaron - Some brief explanation on Pusara Abadi & Pusara Aman. To avoid confusion, I'm only referring to the Muslim cemetery near the SCDF camp, Jln Bahar. 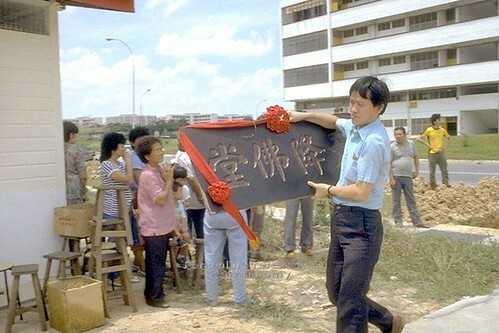 Pusara Abadi hold graves that are transferred (not new) from other parts of S'pore, example, P.Tekong, Sentosa, Siglap etc. For the case of Bidadari, if I am not wrong, the graves have been transferred to the newer sites just after the Chinese cemetery. While at Pusara Abadi recently, I MAY have missed those lesser known cemeteries. However, from another online source that tells about all the exhumation works that have been carried out, nothing of Tekong Kechil & Sajahat is being mentioned. Not even P. Ubin. But info rgd exhumation of graves at ex-Jurong islands are available though. I guessed the authorities may have forgotten or ignored Tekong Kechil & Sajahat, or maybe just like in the case of the Bedok South cemetery... I have actually contacted them, but so far, no news yet. Hmm, now that is very interesting. Are these old graves still situated on Tekong Kechil / Sajahat? Hmmm..that is something I'm still trying to find out. After gathering some info (from ex Tekong islanders),it is confirmed that there were graves @ Sajahat, they belonged to pirates. And yes, there were 2 keramats there, but only 1 is known (Datok Kong). There were also graves at Tekong Kechil.